Prestant 8’, Octaaf 4’, Mixtuur, Holpijp 8’, Openfluit 4’, Gemshoorn 2’, Nasard 22/3’(? ), Sifflet 1’(?) and Trompet 8’. The windchest and the rollerboard are presumed to date from 1625. At the time the compass must have been brought up to CDEFGA-g’’-a’’. Jan Slegel has added the a’’ – c’’’ part. - added a Prestant 16’. - new Trompet 8’, with the use of many old blocks and shallots. - bayleaf upperlips in frontpipes replaced by french, raised mouths. - restoration, mainly of the situation of 1677. - The Trompet 8’ from 1875 was maintained. - meantone temperament re-installed, console reconstructed, original painting of the doors restored. - general overhaul and cleaning. The age of the case is disputed. Mostly 1625 is given as the date, but historical research by the architect D. Spoel in 1974 came up with approx. 1550. Jan van Biezen, in his publication of 1995, opts for the early 17th C. Comparative material is not available: There are almost no organs of a similar construction left from the 16th, early 17th C.. 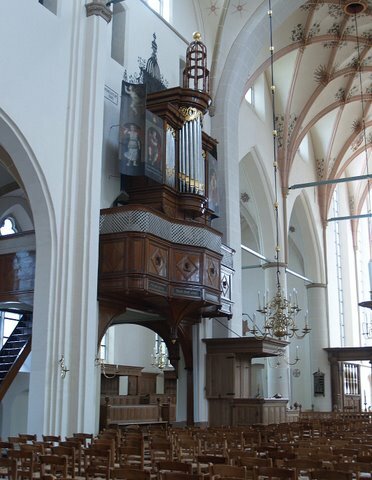 The date of the organ gallery is definitely known to be 1550.